The honest truth is that I’m a native of San Diego, and I spent my winters as a kid surfing rather than skiing, snowboarding or having snowball fights. Aside from a few unexpected encounters over the years, my experience with snow is practically none, and that’s something I’d like to change. With all the talk of an El Nino winter this year, I figured there is no better opportunity than the present to buckle down and get my cold weather clothing system dialed in. As winter set in, I started checking weather forecasts for the local mountains. The opportunity finally presented itself last week. El Nino was sending a storm my way and up to a foot of snow was forecast to land in Cuyamaca Rancho State Park. I waited anxiously as the storm rolled through, checking the forecasts daily until I saw my window of opportunity. As soon as the storm broke, I packed up my gear and headed for the hills to put my cold weather clothing system to the test. Note: If I haven’t provided a link it’s because I’m actively looking for a better solution, or the item’s function is non-essential to the context of this article. Upon arriving in Cuyamaca Rancho State Park, I pulled into the Paso Picacho campground and parked near the picnic area. I changed out of my street clothes and into my hiking clothes, then headed south toward the trail for Cuyamaca Peak. With a peak elevation of 6512 feet, Cuyamaca Peak currently holds the top spot on the Sierra Club’s 100 Peaks List of San Diego County. It is also the second highest peak behind Hot Springs Mountain (6535 feet) in the county and offers a panoramic 360 degree view that extends up to 100 miles in all directions. It was cold out, in the mid to high 30s near the campground. I knew that as I got closer to the summit of Cuyamaca Peak, it would get colder. And the wind was blowing up there, which added another level of complexity. I packed an insulation layer and soft shell windbreaker to make sure I was prepared. The trail is really just a paved, single lane fire road that winds its way up the northern face of the mountain all the way to the summit. On an average day, a hike up the fire road would be pretty unremarkable, but with up to 10 inches of snow cover it was no less than spectacular! The trees were covered in snow and ice that lit up in the morning sun like Christmas lights. As I set out, there was only one set of footprints in front of mine. With intimidatingly dark and stormy clouds still looming over the summit, it was nice to know that I wouldn’t be alone on the mountain. It was also nice to know that I practically had the trail to myself. The climb up was steady and steep, and despite the snow cover, the trail was easy to follow. I stopped occasionally to catch my breath and to take in the increasingly expansive view of the surrounding countryside. Looking out towards Stonewall Peak from the trail. On trail, the snow cover was no more than about 3-4 inches deep. I did my best to step in the tracks of the hiker ahead of me, which helped to keep my feet dry inside the trail running shoes I was wearing. 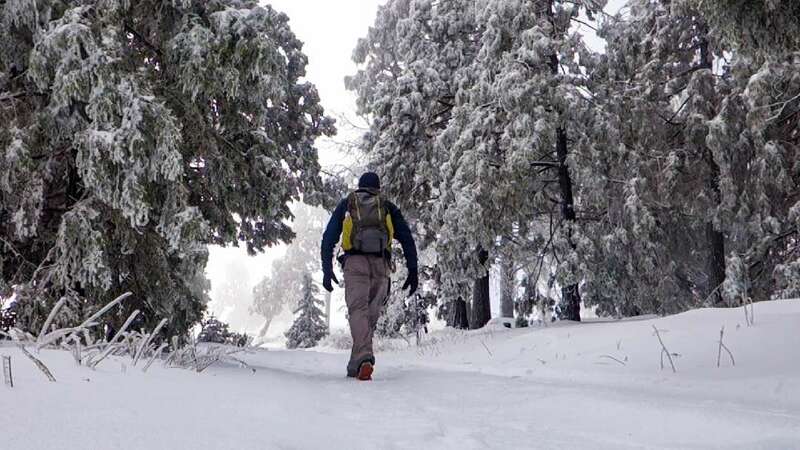 If you’re wondering why I have chosen to forego hiking boots for lightweight trail running shoes, even when hiking in the snow, take a look at, “5 Reasons to Ditch Your Hiking Boots” by Dave Collins. In the article, Dave explains the top reasons why lightweight backpackers are making the switch. To sum it up, trail runners are lighter, easier on your feet and don’t hold onto water the way boots, or even leather hiking shoes will. The snow was shallow enough that the soles of the shoes were able to effectively insulate my feet from the cold, while the uppers managed moisture and kept my feet dry. The wool socks and running shoe combination I had chosen was surprisingly well-suited to this hike. Only later, after more than 6 miles of hiking in the snow and stepping in a mushy ice puddle, would the combo start to fail. 3-4 inches is about as deep as the snow got on the trail. I quickly warmed up as the climb continued. Even with the zippers pulled down on both my fleece and base layer tops, I was sweating. So I slowed my pace and stopped more often to keep the sweating to a minimum and to give my clothes a quick minute to dissipate some heat and moisture. I could have managed comfortably in my base layer top alone. The fleece shirt was overkill for the amount of work I was doing, but I carried on knowing that at any point I could remove it if the sweat got out of hand. The thermal bottoms I was wearing were also too heavy for the active portions of my hike. I would have been much more comfortable in a lighter pair of thermals, or possibly even just some running tights. Despite the fact that I was sweating, however, they did a remarkable job of wicking the moisture away from my body. Overall, I was staying much drier than I would have expected considering how much I was sweating. As for my hands, they tend to get chilled very quickly, even when I’m working hard. So for most of the hike, I was wearing both the liners and the over gloves. The combination I used of liners and outer gloves performed well while I was hiking, but my fingers would quickly chill if I stopped for longer than a few minutes. They also did a fair job of dissipating moisture, so my hands managed to stay relatively dry for the duration of the hike. Approximately three-quarters of the way up to the summit, the temperature started to drop rapidly. It was a welcome change, and I immediately started feeling more comfortable. I was no longer overheated and sweating, if any, was minimal. My cold weather clothing system was working just as it should, keeping me perfectly warm and dry. The temperature dropped as I neared the cloud covered peak. I cooled off quickly in the sub-freezing temps as I stood on the summit taking pictures. To stay warm, I did the occasional set of jumping jacks and gave my hands a few breaths of warm air. There was about 8-10 inches of untouched fresh powder on the summit, so the tops of my shoes were starting to get wet and my toes began to chill. But as soon as I started my hike back down the hill, my feet warmed up and I was once again perfectly comfortable. By the time I reached the parking lot, my shoes were starting to soak through and my feet were officially cold. I did spend some time going off trail on the way down, stepping into deeper snow to take pictures. Had I not gone off trail, my shoes probably wouldn’t have soaked through and they may have proven to be more than enough for the entire hike. As it was, they performed far better than I had imagined. My feet at this point were just starting to get damp and they were cold, but not unbearably cold, so I decided to hike up to Stonewall Peak for some more testing. The lower part of the trail leading to Stonewall Peak is south-facing and had received direct sunlight all day. I could hear ice cracking and snow falling from the trees all around me. The snow on the trail was wet and starting to melt, and in places there were small mushy puddles where hikers before me had stepped. A well-traveled section of trail leading to Stonewall Peak. By the time I reached the summit, my feet were completely wet, as were the front of my pants. I was actively working to keep my toes from going numb, especially when I stopped to catch my breath or take a picture. At this point, my trail runners had failed. But considering I had spent the last few hours hiking in snow, I was neither surprised nor disappointed. Instead, I had simply learned the extent to which I could count on a normal pair of trail running shoes when hiking in the snow. Overall, my cold weather clothing system is pretty solid for this type of hiking. With a couple of minor changes, primarily to my base layer and gloves, I could improve it for slightly warmer or slightly cooler weather. And by substituting a rain jacket for my windbreaker, I would be ready for snowfall and/or light to moderate winds. I’m still working on finding the perfect combination of gloves and liners for my hands. They get cold easily and they also produce a lot of sweat when I’m hiking. I need a glove system that will actively wick away moisture while also keeping my hands warm and dry from the outside-in. The fact that my running shoes didn’t start to fail until late in the hike really surprised me. Overall, I was really pleased with how they performed and I wouldn’t hesitate to wear trail running shoes on a hike like this again in the future. Next time I will add an extra layer of socks, which should help to keep my feet warm and dry a little longer. I will be adding gaiters to my cold weather clothing system for future hikes. They’ll help to shed some of that snow that found its way into my shoes. The last thing that I will do is add some waterproofing to my trekking pants. That simple change should extend the amount of time I can hike in them before they start to soak through in wet conditions like those that I found on Stonewall Peak. I never ended up using my insulation layer or windbreaker, nor did I think I would need to. Had I spent more time on the summit, the extra layers definitely would have come in handy. As it was, they weren’t needed and that was just fine with me. It’s great to know that they aren’t required for a hike like this, but that I can layer up if temperatures drop, or if I take an extended break. My cold weather clothing system has come a long way in the last couple of years, but it’s still far from perfect. If you have any recommendations for improvements I could make, I’d love to hear them. I’m always looking for ways to hike farther, faster and safer – and preferably more comfortably as well.